Next up on the Gentry reveal list is the kid’s bedroom! 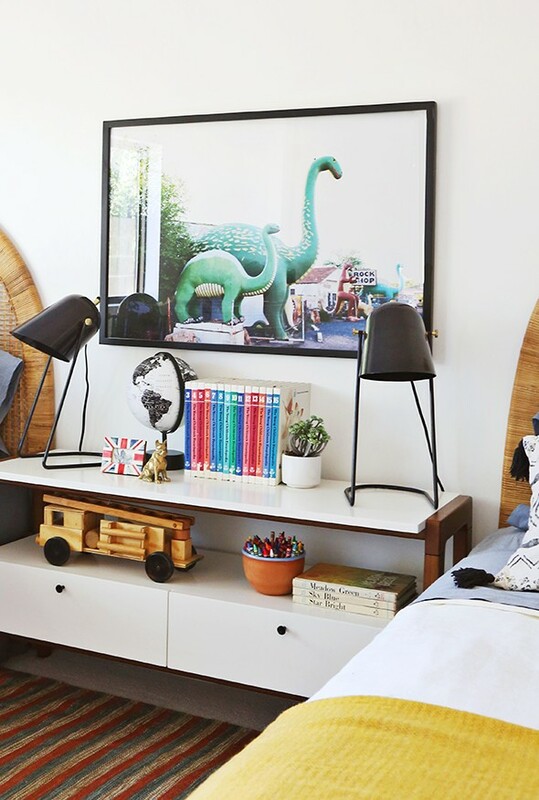 This was the perfect space to use one of our newest prints, DINO from photographer Kate Lines. Isn’t it the coolest? I think this would be fun blown up really big even in a living room! 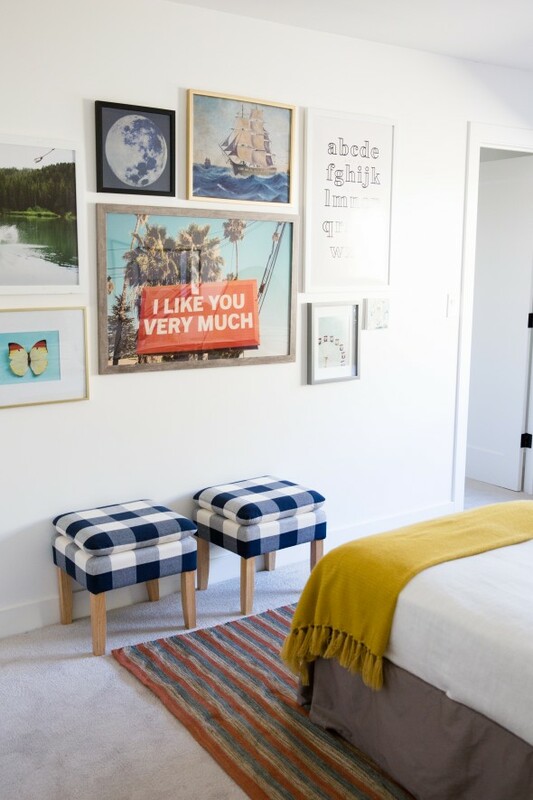 The colors in the new print look great with these AMAZING vintage headboards we got at an antique mall. 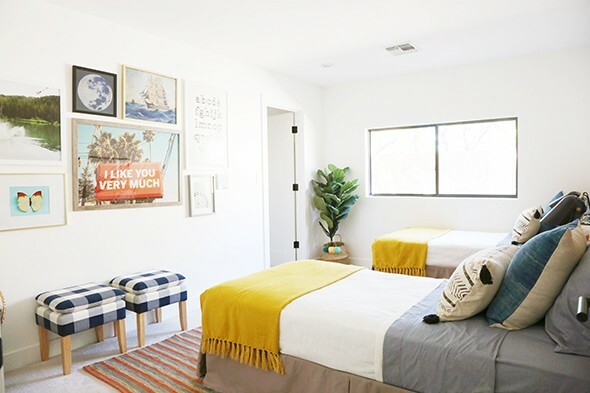 I’m just loving the combo with the striped rug and those bright yellow blankets! 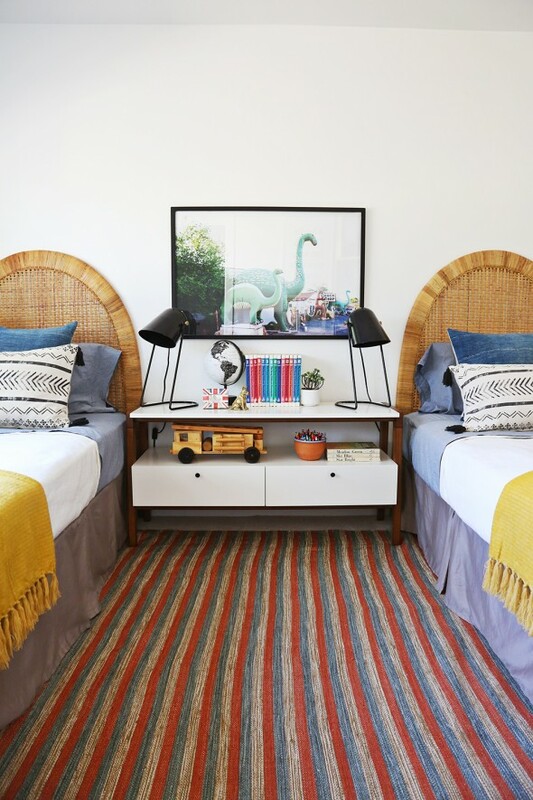 I also love the proportions of the longer console table we used as a shared nightstand between to the two twin beds. 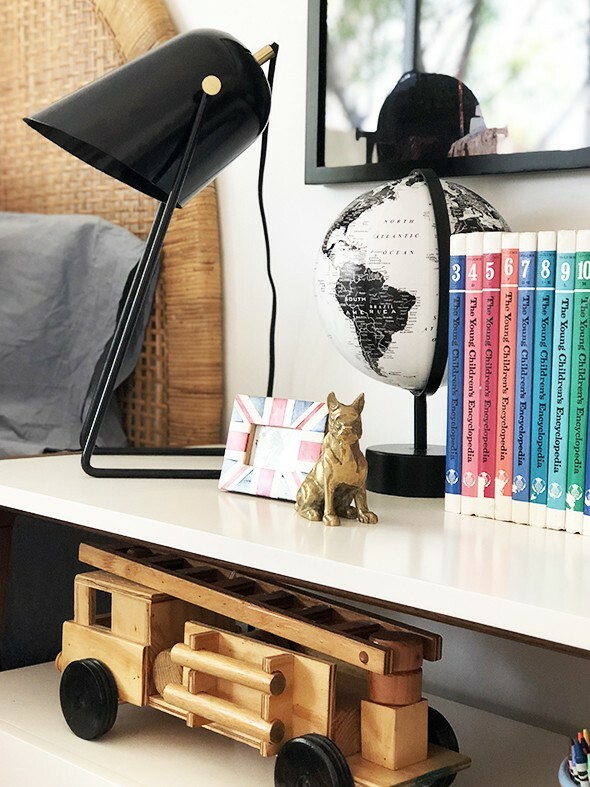 There’s plenty of room for the cute table lamps and a few books! This was a fun, quick room to put together. 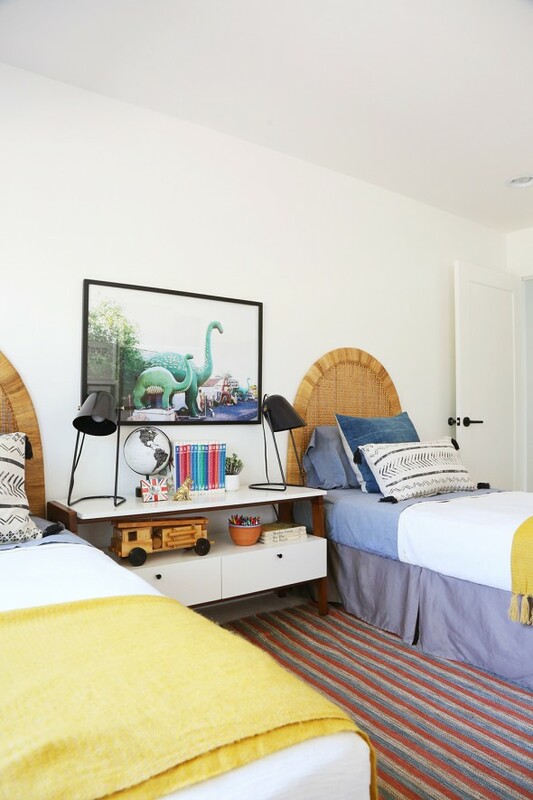 I like that it is clearly a kids space but the colors and textures still work nicely with the rest of the furnishings in the house. Super cute room. Love all the color! Could you share the source for the door hardware (knobs and hinges)? Thanks! I love how you manage to decorate without the space looking contrived. Can I ask what size blue square pillows you used? Are they Euros? yessss! that is exactly what I love, it’s that imperfect, perfection! So adorable! 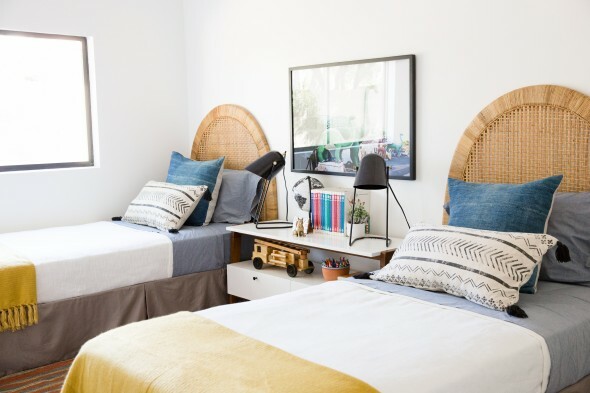 The console table as shared nightstand is genius!! I really love the actual black lamps. Are they vintage??? Jenny- this room turned out beautifully! 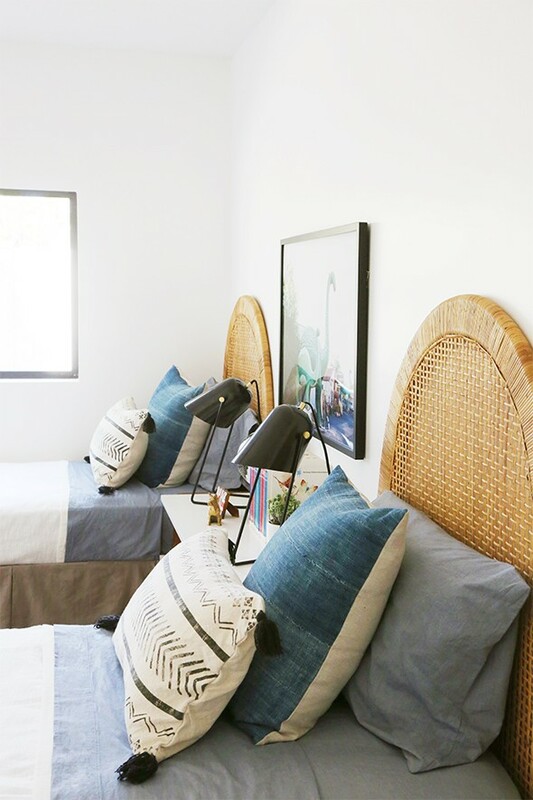 I love the headboards- isn’t designing a room with two twin beds so fun?! And the Dino print is my new favorite. I keep trying to think of a place to put it. 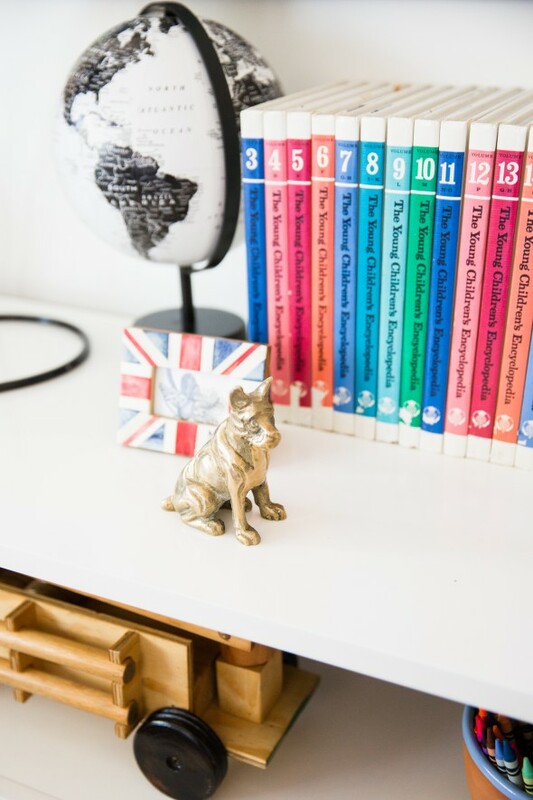 Such a fun kids room! The console idea is a good one. Gives more room for the kids-obviously it will be a playspace/table top, and it’s a space saver for furniture layout. for some reason, it’s really a pain for me to leave a comment…. (required log in) but I had to go through the steps to say…..
DANG< GIRL……this is SO SO SO good! you never stop amazing me with your talent but this is just captures it all. I will be buying the dino print for my son, at a minimum form this inspiration. Jenny, Can you help me? I’m trying to get the August print printed on a canvas, but the file is too large for the website. Do you know how I can make the file smaller so I can use it?? Thanks! I would love to know what sizes of prints you did and where each of these frames are from. I want to copy this photo wall in my house. It’s perfect. Hello. You probably mentioned it somewhere, but I have searched and can’t find it. What kind/color carpet did you put in the kids rooms? It looks nice and neutral, but it looks like maybe it has a subtle texture? I am struggling with putting carpet in the kids rooms, but it’s for resale and I think that’s what people like? Plus it’s obviously more budget friendly. I’d love a specific recommendation so I can trust it will turn out well.